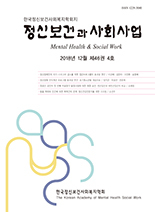 이형진, 황동진,(2015).부모의 학대와 방임이 청소년의 공격성에 미치는 영향.정신보건과 사회사업,43(1),5-31. 본 연구는 부모의 학대와 방임이 청소년의 공격성에 영향을 미치는지에 대해 실증적 검증을 시도하였다. 특히 청소년의 휴대전화 중독을 매개로 공격성이 변화하는지를 살펴보고자 하였다. 이를 위해 한국청소년정책연구원에서 조사한 한국아동ㆍ청소년패널조사(KCYPS) 3차년도 자료를 활용하였다. 연구결과 첫째, 부모의 학대와 방임은 청소년의 공격성에 정적인 영향을 미쳤다. 이는 청소년이 부모로부터 받은 신체적 학대나 폭력적인 언어를 학습한 결과 공격성으로 표출되었기 때문으로 볼 수 있다. 둘째, 부모의 학대와 방임은 휴대전화 중독을 매개로 공격성에 정적인 영향을 미쳤다. 이는 학대와 방임을 경험한 청소년이 대인관계의 형성보다는 다른 매개체의 의존성이 높아지는 것과 관련이 있다. 혼자 있는 것에 익숙한 아이들이 가장 손쉽게 접할 수 있는 것이 휴대전화이다. 휴대전화에 의존할수록 혼자만의 고립된 형태로 전락할 수 있으며, 자신의 감정과 타인의 감정 사이에서 조절력을 기를 수 있는 기회를 잃게 되어 공격성이 커질 수 있음을 의미한다. 이상의 결과를 바탕으로 학대와 방임, 청소년의 휴대전화 중독, 공격성에 대한 사회복지적 개입을 논하였다. This study attempted empirical validation about the effect of parents` abuse and neglect on aggression of youth. In particular, we were to examine if aggression is changed by a medium of teenagers` mobile phone addiction. To this end, the 3rd year data of Korean ChildrenㆍYouth Panel Study(KCYPS) surveyed by National Youth Policy Institute were used. According to research findings, first, parents` abuse and neglect had a positive effect on aggressiveness of youth. This can be interpreted as because teenagers learned physical abuse or violent language received from parents and as a result, it was expressed as aggression. Second, parents` abuse and neglect had a positive effect on aggressiveness by a medium of mobile phone addiction. This is related to the fact that teenagers who experienced abuse and neglect are getting dependent on other mediators than the formation of interpersonal relations. It is a mobile phone that is the most easily accessible to children accustomed to being alone. As getting dependent on a mobile phone, they may be isolated alone and lose the opportunity to grow their feelings and others`s feelings, meaning that aggression can grow. Based on the above results, abuse and neglect, teenagers` dependency on mobile phone and social welfare intervention for aggression were discussed.